These bivalve mollusks grow in large colonies, each being bound to its bed by an anchor of threads called a beard. These beards are more pronounced on wild mussels, as they must get a firmer grip in tougher environments. They are easily removed by a quick tug. One of the most popular and probably the highest quality farmed mussel available is the Prince Edward Island Mussel — called Island Blue or PEI. Grown off the island of the same name in the French River of Canada, these mussels are consistent in quality, plump and tender. Available year round, (with a small period for spawning), these little crustaceans offer a delicious and interesting diversion from finfish. In a deep saucepan, sauté onion, garlic and ginger in oil for 3 minutes. Add curry powder and stir for 30 seconds. Add wine and simmer 1 minute more. Add cleaned mussels and steam, covered, 4-6 minutes, shaking pan occasionally until mussels open. 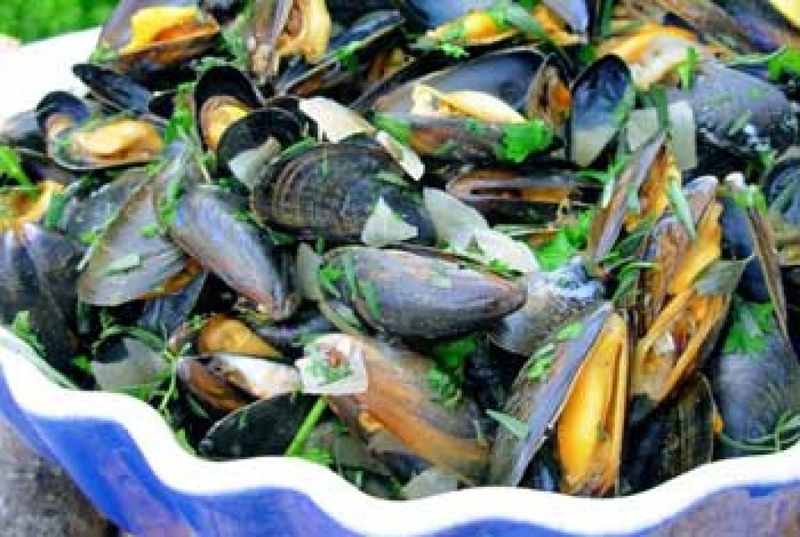 With slotted spoon, transfer mussels to large serving bowl and cover to keep warm. Discard any that do not open. Bring cooking liquid to a boil and reduce, cooking 3-4 minutes. Add cream and cook 2 minutes more. Season with salt and pepper. Add cilantro. 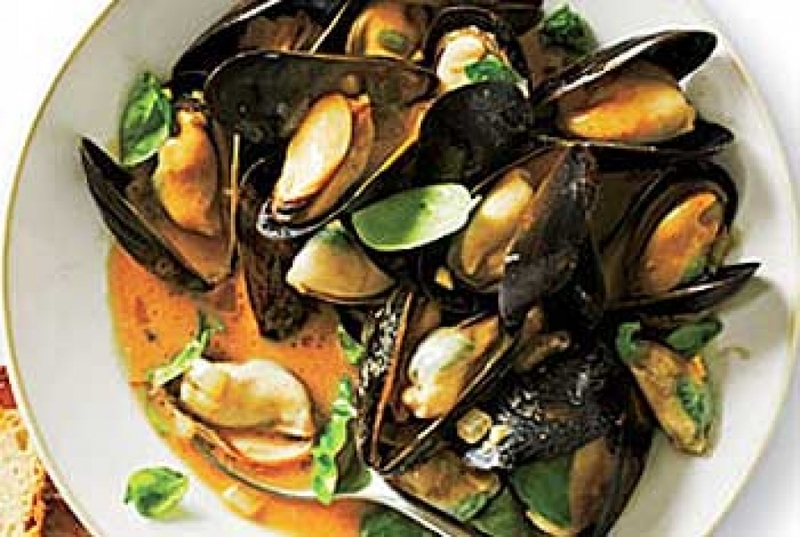 Pour over mussels and serve with crusty bread for dipping, or over pasta. Serves 2. Sauté garlic in butter 2 minutes. Add red pepper, olive oil and water. Bring to simmer. Season with salt and pepper. Stir in parsley. Add mussels and cook, covered, 4-6 minutes until mussels open, shaking pot occasionally. Discard any that do not open. Serve with crusty bread. Serves 2.